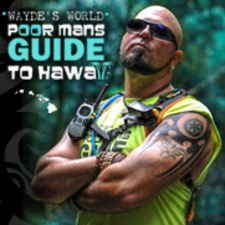 Wayde is one of the true Ambassadors of Paradise and a Hiking Guide Master who has been showing Travelers and Vacationers where to go and what to do in Hawaii for Free for 5 years and counting through his Detailed online "Wayde's World Hawaii" Youtube Video Library offered to the public at no charge and his FREE MEMBERS ONLY Website. Wayde works as a radio host on the "Lucky we Live Hawaii" Podcast show with fellow personality Aloha Bruce who he is partners with at Hawaii Jeep Tours. Wayde also Works for the Oahu SPCA a GUIDE MASTER with his "HIKES FOR HOMES" Program and helps get the Homeless Dogs out of the Shelters and onto the Trails to help family members see the Dogs in real life situations instead of cages, making people more interested in adoption. Wayde is also one of the Founders of the Non-Profit "From Mauka to Makai" dedicated to teaching ENVIRONMENTAL EDUCATION, RESPONSIBILITY, COMMUNITY, CULTURE, ISLAND VALUES, WELL-BEING, and the ALOHA SPIRIT to the local community and tourism industry here in Hawai'i.